This is another post from my Taiwan Leg of my trip this time at a preview of a wedding banquet. It's where a restaurant is presenting it's dishes and the bride and groom are trying all the dishes (usually gratis) depending on how big your wedding party is. Keep in mind a standard wedding party in Taiwan is something on the order of 60 tables of 10 to 12 people each. Food is a central theme in an Asian wedding so the banquet really takes the place of the giant wedding ceremony. There are smaller private tea ceremony for the immediate family and every city has it's own traditions but the big deal is the banquet itself. I'll keep this post short since it's a ton of dishes and you really don't want me yammering on and on about stuff. Edit: Ok I lied, I did a lot of yammering on this one. Just a note I did both this and last post completely on an iPad, camera connector and iPad photo cleanup apps. Is mochi sweet or savory? Is it meant only for desert? Apparently not. This starter dish is called "Tang Yuan" which is a type of mochi made with tapioca starch, this particular rendition is got a bread crumb with raisins. It's got a cool chewy texture. A common appetizer is a cold platter. 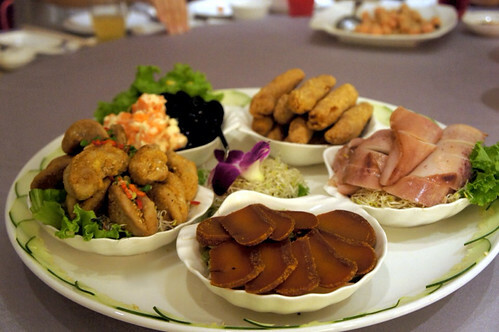 These small dishes are often served alone as an appetizer to be consumed with alcohol (never an empty stomach) but are also served as part of an appetizer course. I'm afraid I cannot identify everything since I couldn't get a translation for the bottom left dish (the kidney shaped things) but apparently they come from the internals of a Black Mullet Fish. Above that is a fresh fish roe with japanese mayo and sweet black beans. To the right is a spring roll and grilled squid. And finally a very expensive delicacy of cured Black Mullet Roe. The Mullet roe is my favorite thing in the world, actually the italians have the same item (they use it as an ingredient in a pasta) it's called Bottarga di Mugine. Both are prepared the same way of a salt cure and sun dried. In the dish as pictured the whole roe sack is then steamed and sliced thin. For the Italians they grate it over pasta. My favorite preparation is first steaming then pan frying the roe before slicing it. The pan fry really brings out the aroma of the roe as well as causes the little eggs to form hard little spheres that burst into spheres of amazing flavor. Preview banquets are just that, they are tastings that the wedding party may or may not turn down. There's no way for me to know what will or won't make the cut. Typically the happy couple don't have a selection choice in the process, it's usually the family(s) involved (typically the party that pays) that makes the final choice. Yes this dish is controversial but it's a delicacy and considered a "high honor" dish to present to guests. 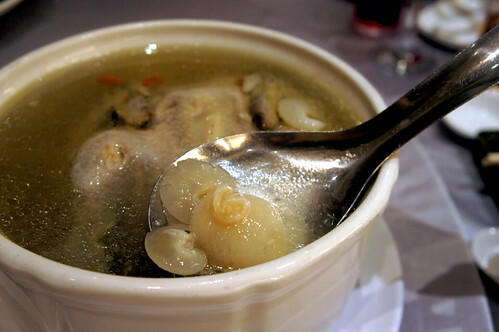 The soup is a chicken soup with Chinese medicinal herbs with Shark fin. I'm sure i'll get some flames on this one but again food is food and I'm just here to document what I see (and eat). The soup does have a distinct Chinese "medicinal" earthy herbal quality the only ingredients I could identify for sure were ginger, ginsing, and dried goji berries. 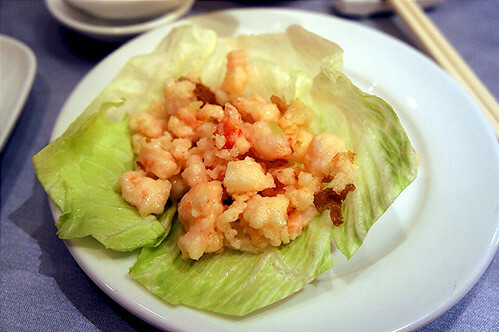 For some reason seafood is very prominent in wedding banquets this is a Stir fried shrimp wrapped in lettuce. The shrimp is marinated in cornstarch and water and stir fried with water chestnuts. 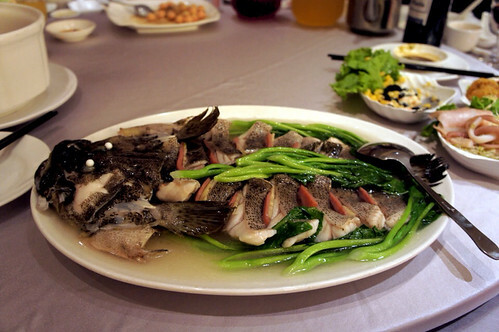 Although very plentiful and available seafood is still considered "expensive and rich" food that you must offer your guests to show you are generous. Personally I'd like some more variety maybe even some more vegetable dishes. My girlfriend was unable to translate or tell me what type of fish we have here. It's a white fish that's been blanched and then treated with a brown sauce. The texture was very flaky and light. The red and white slices were ham and fish cake. Wedding food as I said revolves around a lot of seafood this is a baked lobster, Asian people aren't afraid of shells or fishbone so you often see people picking things apart without the help of utensils. The thing I found interesting with this dish is along the side what looks like noodle bundles is actually Konnyaku noodles, the miraculous japanese food of zero calories. I wonder how that came into Chinese cuisine? Probably because Taiwan has often been referred to as "little Japan" due to their adoption of a lot of Japanese fashion/TV/culture. Banquet food.... Un-ending procession... going to explode. 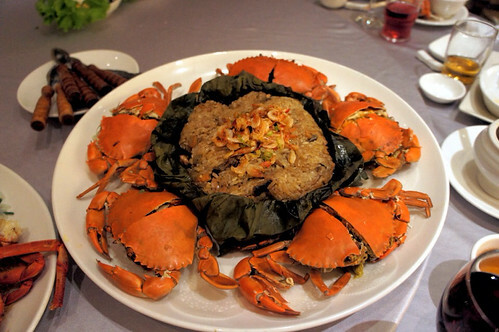 So even with this sticky rice wrapped in lotus leaves they managed to sprinkle on some dried shrimp and serve crab to insure there's seafood. Not much to say here. On the right we have shitake mushrooms, on the left steamed broccoli in the middle on top of braised iceberg looking lettuce is what is called nine hole abalone. Nine hole abalone is a cousin to "abalone" proper. 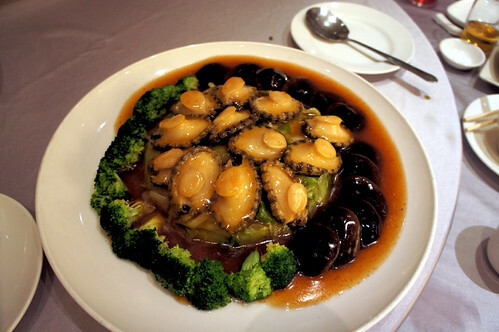 Abalone is much larger and has been over fished to the point where it's super expensive and near extinction. There's a bunch of info on abalone so I need to do a bit more research before I can report more on the difference between nine hole and abalone, nine hole may just be a younger abalone. Rest assured it's yet another seafood/shellfish that's considered a delicacy. 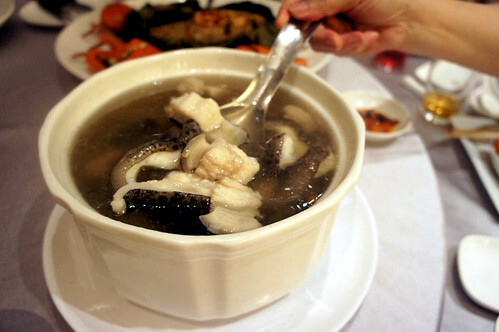 October seems to be a better time to serve two soups in a banquet, it's hot enough in Taiwan. I was curious as to what they were thinking with a second soup. This one has a similar herb/medicinal base as the one before but this time it's served with fish. I'm not sure what fish but it had a high fat content between the skin and the meat. Six fruit dessert course. 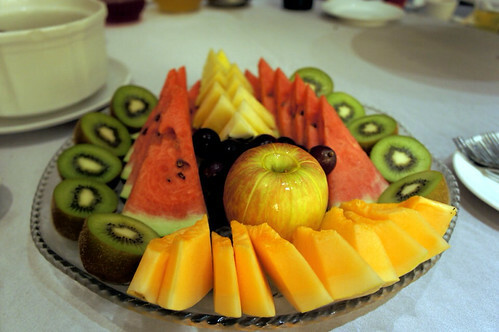 Not much to say here, it's traditional to serve fruit near the end of the meal. Very near the end here. Just as I think we're in the dessert clear they throw a curve ball. The surrounding pastries are a blueberry pastry/pie and the center is a steamed meatball in sticky rice. It's kind of a weird mix of savory and sweet. I stuck with the meatballs and had a taste of the blueberry treat (too sweet for me). Excited! we're done! 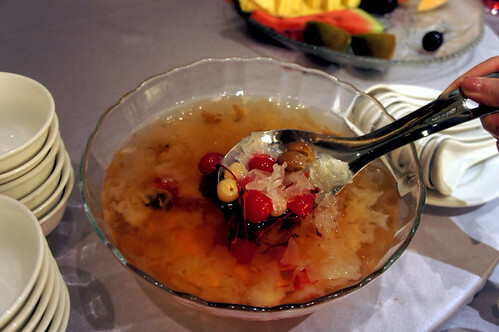 Final course is a traditional dessert soup with white woodear mushrooms, lotus seeds, cherries and dates. It's to wish the new couple "fertile success" meaning you better have some grand kids for us soon after we pay for this banquet. It's a sweet soup served cold and I know it's unusual to have mushrooms in dessert but if you think of it as a crunchy gelatin and not what you normally consider as mushroom you'll be good. Well that's it for this post. I might squeek another out but this final leg of my trip to Dallas hasn't presented any cool food to snap pics of. So this might be the last post for this trip. There's an easter egg in this post! Comment if you figure it out. 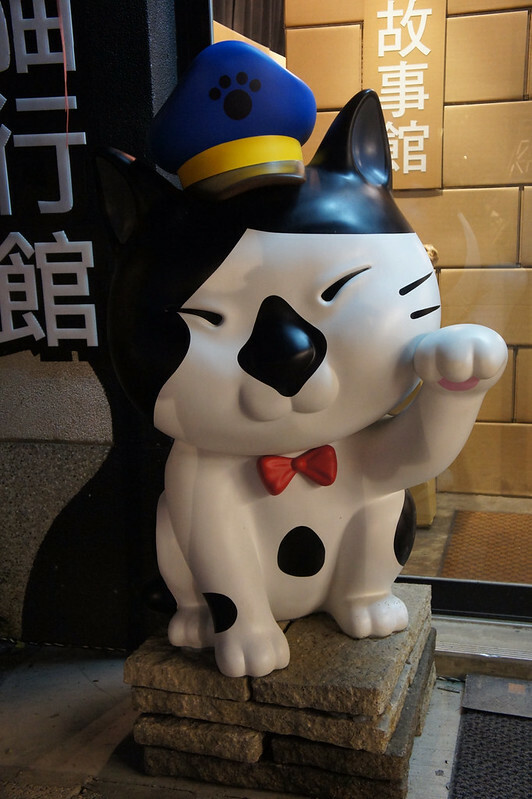 The second leg of my trip was a week in Taiwan. We took a small excursion with my girlfriend's family to a spot called Lavendar Cottage. 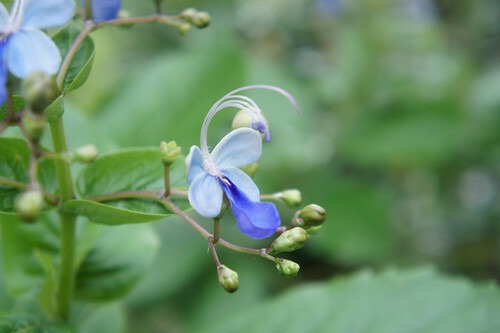 There are a few of these dotted around Taiwan it's like a chain of flower gardens. You can rent a room in one of their cottages there on site although spending half a day walking around you pretty much see everything. As the name implies there are huge fields of lavender as well as a lot of other neat flowers and animal life. The park was stared by two sisters that wanted to grow spices and herbs and create a beautiful place for people to visit. (that's about as much as I was able to determine about the background of the place) The shops are full of soaps and fragrances made with herbs and flowers grown from the park/garden. I'll reserve the flowers for my non food blog but I had to post this picture of this giant snail that we ran across, I dropped my lens cap next to it so you have a sense of scale, it was roughly the size of my fist. 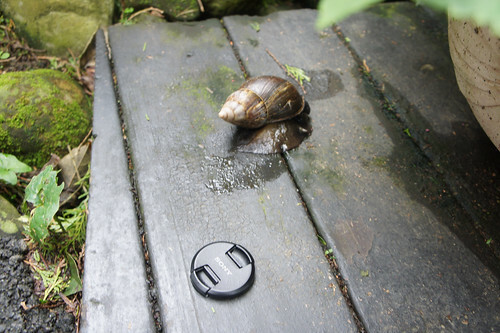 Despite it being a snail I still had an irrational fear of it leaping at my hand as I put the lens cap down. The park was full of such wonders. 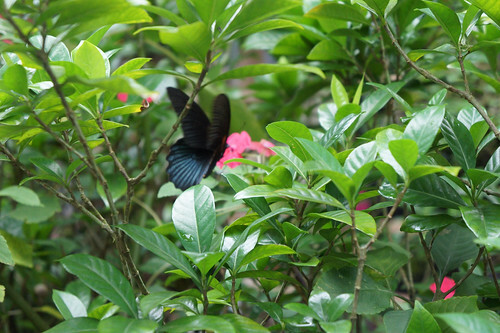 They had butterflies larger than I've ever seen and I even found a chrysalis waiting to pop open and reveal a new butterfly. It's a pretty amazing place. If you ever make you're way to Taiwan it's worth a day trip to check it out. 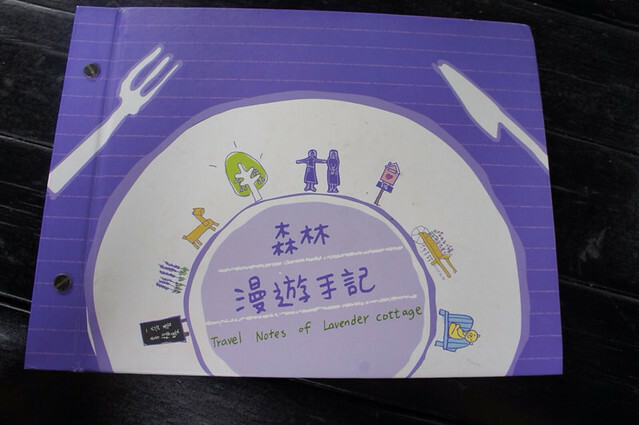 The one in Taichung is the original Lavendar Cottage. So the park also had a restaurant in it. It seemed pretty popular. The menu selection was pretty small but that just meant they could focus on producing really good food. We ordered an assortment of entrees and split them up so everyone got a taste of everything. Every meal came with fresh baked bread and a tomato cabbage soup. The bread came with a pesto mayo dipping sauce. (sorry I didn't get a picture). The soup reminded me of a minestrone soup without the pasta or beans. Along with soup there was a nice salad with a light vinaigrette. 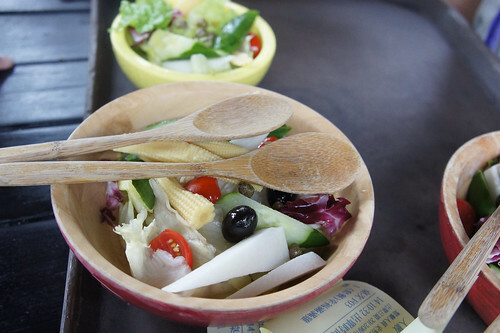 The salad was more like a crudites bowl, with large chunks of fresh vegetables very light on the lettuce. The whole meal was like the salad, fresh and light. Next is a stuff chicken breast with pine nuts and mushrooms. The chicken was very tender and delicious, the stuffing was perfect, giving a nice bit of texture from the pine nuts and great flavor from the golden straw mushrooms. The village leading up to the lavender cottage is known for it's mushroom production (all sorts of mushrooms), all of the shops lining the road had huge bags of dried mushrooms and we'd drive by huge structures covered by black cloth where the grow the mushrooms. Apparently it's cool enough in the mountain region that a covered building is sufficient for mushroom farming. I'm still doing a big more research to understand mushrooms, apparently there's a lot to them. Finally a lavender herbed chicken served with roasted garlic and a breaded boiled egg. Obviously with a name like Lavender Cottage everything had a bit of lavender in it (even the water they served which turned out pretty tasty). The chicken was very moist and the meat was pull off the bone tender. 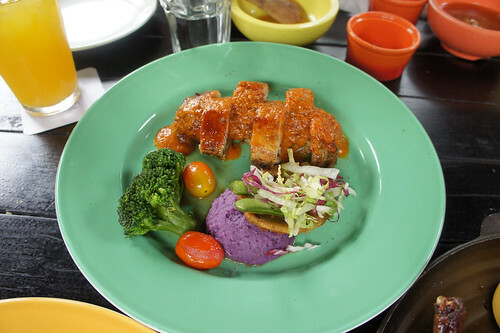 Each of the dishes included the blue mashed potato, which I guess is suppose to be lavendar in color. Either way it tasted more like a sweet potato so i'm not sure if they had some sort of purple varietal or if they simply colored it for presentation sake. It definitely did not taste like purple colored mashed potatoes. The egg was interesting, I don't think i've ever had a fried hard boiled egg. 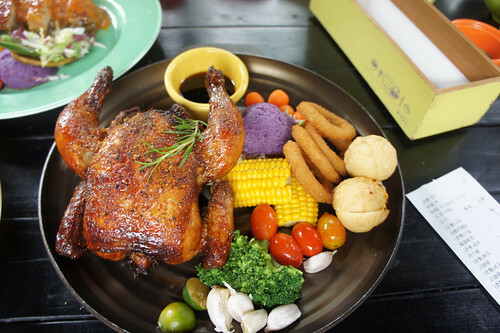 Overall, I really like the presentation of each of the dishes, it had a rustic simple feel. The restaurant itself was open air, we sait in large gazebos surrounded by beautiful flowers and birds. So I took a last minute trip which included a stop to LA for a wedding reception for my girlfriend's friend. It was a great reception the groom was Vietnamese and the bride was Taiwanese. The banquet was a fusion between the two with the hosts repeating everything in English, Chinese and Vietnamese (very impressive if not tiring for them). There was plenty of singing and dancing but most of all food. I'm going sparce on the words and more with the pictures. I've got a few more posts coming from this trip but I wanted a chance to document everything. So I present to you stop #1: LA wedding reception. Sorry about the pictures, they were done with my cheaper point and shoot and as the night went on it got pretty dark. I need a high speed point and shoot that fits in a pocket anyone got any solutions? Prawn Roasted Chicken Salad. These were very large prawns dressed in a mayo based dressing. The topping you see is a fried rice noodle. Fish tripe and Crab Soup, yes you heard that correctly Fish Tripe. Who knew fish had big enough stomachs to be put into a soup. It's a first one for me. 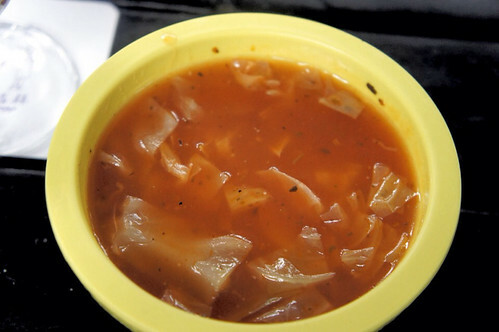 Very taste, the base was reminiscent of a hot and sour soup being that it was flavored with soy sauce and had a thick cornstarch texture. 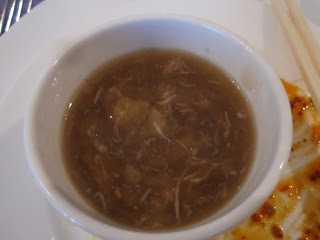 The "tripe" reminded me of the same texture as shark fin soup, a soft kind of crunch taste. Candied Walnut Shrimp with Shrimp Ball. 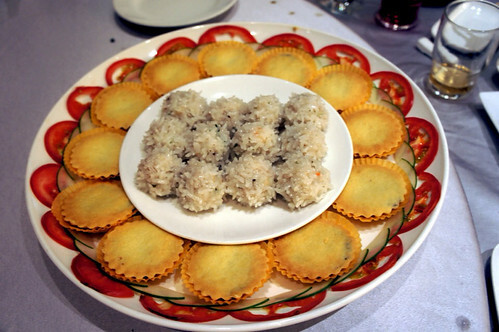 The "Shrimp Ball" is actually a course chopped shrimp mixed with water chestnuts and deep fried. 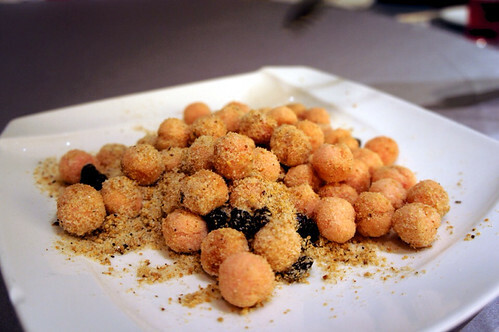 The Candied Walnut Shrimp is a typical dish in most Chinese banquets. 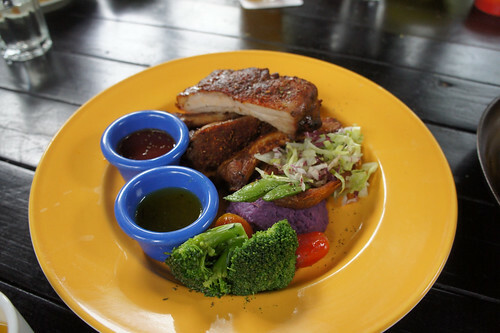 Seafood braised Duck (are you getting the idea that asian cuisine puts a premium on seafood?). The duck is a bit buried under everything else but it was pretty tasty. Since duck has such a nice fat layer under the skin my preferred serving is a crispy skin, the sauce of the seafood kinda got it all soggy. Furiwa's House Special Maine Lobster. 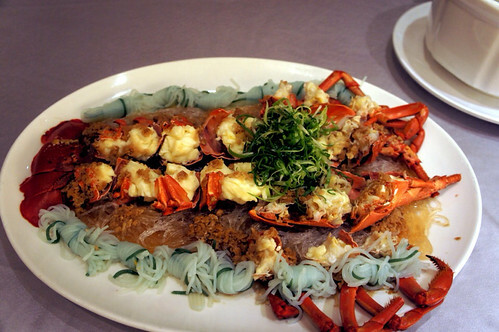 The lobster was cut into large chunks in shell and spiced and wok fried. Very nice flavors in the sauce. This is a typical asian way of serving shellfish, you need to pick out the meat yourself, this is probably a turn off for most Americans but there's a lot more flavor in the sauce when you're cooking the lobster shell in. House Special Fish Fillet, not much to say here, it's a fried fish. Lotus leaf wrapped fried rice. I'm not sure what the lotus leaf is doing for the dish, but it was a delicious fried rice. Finally dessert is a "whipped taro dessert" which is a taro root which has been mashed and whipped into a light consistency adding sugar, peanuts and dates. Taro has both a sweet and savory application in asian culture, but it has the extra super power of being presented in many ways, fried, steamed, boiled, mashed as a dessert or as an side dish to a main entree. It's a very versatile root vegetable. Sorry that the picture isn't a bit more appetizing, but it's the best I could do without hitting the flash. Ok that's it for now. I've got many other pictures to process on this trip, hopefully I'll have time to get to post them all. I'm going to try to keep all the food pictures here and the rest on my personal blog (ok my OTHER personal blog).